Few twentieth-century novels cast shadows anywhere near as long as Nineteen Eighty-Four. It was not the first dystopian novel, as it clearly cribs from Huxley's Brave New World (Huxley certainly thought so - follow that link, by the way), and there are plenty of novels from the 20th century which were more influential, in literary terms, than Orwell's final book. (Even the whole dystopian/alternative history type of novel has largely been submerged into the science-fiction genre.) Yet it's hard to think of any other English-language novel that has contributed anywhere near as many ideas or phrases to our society as has Nineteen Eighty-Four. (Catch-22 gave us the title, of course, but not as much else from that book has penetrated public language.) 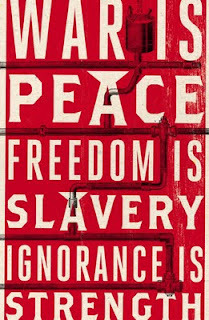 A short list of words/phrases from Nineteen Eighty-Four: Big Brother, doublethink, thoughtcrime, memory hole, Room 101, 'Oceania has always been at war with Eurasia'. Not to mention one of Orwell's most famous sentences: 'If you want a picture of the future, imagine a boot stamping on a human face - for ever'. Orwell does - and does surprisingly subtly and effectively - an excellent job of building his world. Yes, occasionally the polemicist in him gets the better of the novelist in him and he does sometimes disobey the 'show, don't tell' rule of storytelling with wild abandon, but it's the small details in the first section of Nineteen Eighty-Four that really convey what we need to know. The dreadful taste of the standard-issue gin, the scarcity of razor blades, the horrible lunches served at Winston's work - they all emphasise the sheer poverty of Oceania. Similarly, Orwell never defines a lot of the terms or groupings Winston encounters, but he tells us all we need to know and leaves us to fill in the blanks ourselves. And this is all aside from the fact that one of the most damning critiques of the Soviet Union came from the Left, and came remarkably early (whatever modern-day members of the Right might want to believe, Orwell would have had very little sympathy for their arguments). The love story that forms the centre of the middle sections of Nineteen Eighty-Four is - perhaps surprisingly - another instance of Orwell's skill and an oft-overlooked reason why this novel works as well as it does. Winston and Julia may not be the most-lovable characters in all of fiction, and their 'romance' is based almost entirely on their shared unorthodoxy, but it also presents each of them, in their different ways, with a chance to be human in a way that nothing else in their world does. Together they find a small way to reject Big Brother and the Party, and that's enough to override their knowledge that none of it can or will last. Humanity, our shared need to feel things, is the only way to respond to a system designed to crush everyone into uniformity. One of my problems with Nineteen Eighty-Four on previous reads has been the overly long extract from Goldstein's book presented halfway through. This has all the excitement that one would expect from a forty-page section of a novel wherein the two main characters sit together and read a book called The Theory and Practice of Collective Oligarchy. It is - I still think - too long and it derails the book's momentum to that point. Yet, re-reading it over the last couple of days, I couldn't help but wonder if that wasn't the whole point. The frustrating thing - for Winston, for us - is that this book, so long sought-after, promising so much, ends up being somewhat underwhelming. It doesn't really tell us (or Winston) much that we/he don't already know. And since he never gets to finish reading it, we never get to anything interesting. But maybe that's intentional. O'Brien later tells Winston that he co-wrote the book and emphasises that it - being a part of the Party's plot all along - merely confirmed Winston's suspicions without offering any suggestions or possible remedies. The dissidents' plot is hopelessly vague because it has to be. 'Goldstein's' book is repetitive, longwinded and obvious, and that should be our first clue that it's not what it appears to be, what Winston wants it to be. Of course, Nineteen Eighty-Four finishes on a decidedly pessimistic note. Our hero is beaten, in every sense, and loses whatever humanity and individuality he had gained in the first half of the book. He betrays, and is betrayed by, the only person he really cared about, and is betrayed by the only person he admired. His triumph at the very end is amongst the most depressing in all literature, for it represents the flickering out of the last prospect of hope we could have had for him. We can hope that his earlier feeling that the Party would be overthrown, eventually, might come true, but there's no reason for us to think that, really. It's also worth noting what a dreadfully depressing world the Party has created for themselves. Even the Inner Party, the controllers of Oceania, lead lives that are caught up in the world they have created. They may have more luxurious surroundings - nicer apartments, better chocolate and booze, less risk of being exterminated - but ultimately they live in the same depressing world as everyone else. Being the face stamped on forever is obviously a horribly grim future, but being the wearer of that boot is hardly a great prize either. Humanity is removed from both ends of the scale, leaving the world nothing more or less than a machine. Nineteen Eighty-Four isn't Orwell's best novel - that's Animal Farm (which also gave us at least one memorable and much-used phrase) - but its qualities as a book and as a story are often overlooked because of its remarkable qualities as a piece of political and social writing. Orwell was not the finest prose writer of the 20th century, but his simple, direct and understated style serves this story better than anything else would have. And he still gets in some wonderful writing - that first sentence is among fiction's best ('It was a bright cold day in April, and the clocks were striking thirteen'). I came back to Nineteen Eighty-Four for the political and social observations, but I finished it with a stronger appreciation for what a wonderful novel it is.